Our goal is to unite all martial artists regardless of rank/style/system without politics. Combat Dynamics International Martial Arts Association is strong with many diversified martial artists throughout the world. Instructors can keep their independence and advance in rank. School owners can prosper through our business consulting. Beginning martial artists and advanced martial artists can learn White Tiger Kempo and Jeet Kune Do and obtain ranking. advanced martial artists can add to their own system. Learn exclusively from the founder of White Tiger Kempo, Tom Bryan. Learn Bruce Lee’s original Jeet Kune Do. Obtain Certificate of Membership for each and/or both divisions. Purchase training videos for home study. 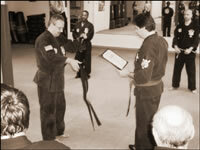 Receive certificate of recognition if a current Black Belt and/or Colored Belt from another system. Be eligible for rank advancement and accelerated instructor training program. Black Belt testing and advancement. Business Consulting for the martial arts school owner/instructor. Home Study – The practitioner can train at home through the use of video tapes. Any questions can be referred to Master Bryan who sends you a personalized video tape on testing and utilization of techniques. A training manual outlining the requirements for rank certification is also available. 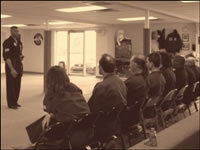 Rank advancement can be accomplished through video tapes and/or at seminars which Master Bryan is conducting. Seminars are held across the US allowing the practitioner to receive personalized attention, learn advanced techniques and test for rank certification. Association members can visit and train at any New Jersey location in a private or group class. Individuals interested in training can be referred to a chartered school in their area. Association members can test for rank certification in their current system/style or after receiving training in White Tiger Kempo or Jeet kune Do through the aforementioned methods. There are 4 phases in Jeet Kune Do and testing for Black Belt Instructor level must be accompanied in front of the Board of Instructors. There is a traditional belt ranking system in White Tiger kempo. 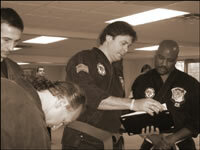 testing for Black belt must also be accomplished before the Board of Instructors. There are specific requirements for each rank level of each division. Practitioners of other systems/styles may advance in rank through video testing. Qualified association members may make application into the Instructor Development Program and have the opportunity to train in one or both of the aforementioned divisions as an apprentice instructor. These individuals will be in an advanced accelerated program receiving special training to become certified instructors. They will be trained in how to set up their own classes and/or begin a commercial business to perpetuate the learning of White Tiger Kempo and Jeet Kune Do. Instructors of other systems/styles may keep their independence and teach their own curriculum. They can add any of our techniques to enhance their training. These instructors can also advance in rank in their own system and reap the rewards of martial arts school business consultation from our association at no additional charge. Contact Master Tom Bryan for more detailed information at (609) 371-9797.